Vodafone Latest Roaming Rates - Should You Speak More? The Whole country was waiting with bated breath for roaming charges to be done away and mY Kapil Sibal let us down by not doing the same as he succumbed to the pressures of the telecom companies and gave the verdict in favour of telcom providers and asked them to provide specific plans to the users and thus roaming free nation is still a distant dream. Now Vodafone has launched a Rs 5 a day scheme offering free incoming calls, cheaper outgoing calls and SMS rates during national roaming. Vodafone will charge 1.5 paise a second for outgoing call under this daily plan. This appears to be an OK plan but still a lot more can be done. Vodafone’s monthly plan priced at Rs 71 for Prepaid customers and Rs. 75 for post paid customers, which will entitle them to free incoming calls on roaming. Apart from the free plans, Vodafone has introduced 2 new roaming tariff plans for both their pre-paid and post paid customers called Roaming Tariff Plan (RTP) and Roaming Tariff Plan Free (RTP FR) that offers reduced rates on incoming calls while roaming. These plans start from Rs. 196 for prepaid customers and Rs. 149 for postpaid customers and vary slightly from state to state. 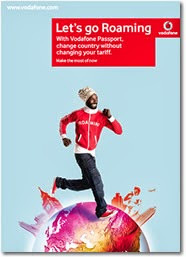 To activate this plan, Vodafone customers will have to simply dial *444*500# from their mobile handsets. We were excited to use the free incoming while on roaming and with all vigour made a call on 06 Jul 13 to customer care at Vodafone and we were taken aback when the customer executive told that they have got no response from their company regarding such plan. Mind it; this plan is effective wef 01 Jul 13.